Pinot Noir by Walkerville of Gippsland. . A significant early release of a small batch, single vineyard Pinot Noir, grown to the fully fertile soils of a beef and lamb stud under the brisk temperate climes of Gippsland South. Spices, sen sen and stalk, the piquancy of pectins, its exciting sasafras oak tannins in undulating support, all the way to the end of the rainbow, a very cherry, peacok's tail of ripe, Gippsland fruit. The Rich family have been farming at Walkerville South Gippsland for five decades, mainly producing high quality lamb and beef. While they’ve spent many years on the land, developing animal production systems, a challenge that faces farms in Australia is to consider ways to make products that add value and uniquely reflect the characteristics of the region. The cool climate and good soil, sandy loam over clay, suitable aspects of different sites on the farm, provided an opportunity for growing premium cool climate wine grape varieties. Added to this, is the family’s passion for wine and precedence set by the region's small number of established vineyards and brands. Working with family members whose respective passion and professions have all helped to shape the foundation and direction. The Rich family originally planted the vineyard in 2006, which true to form, was a difficult year due to the drought that was gripping Victoria. This threw up all sorts of challenges that forced them to learn the reality of managing a vineyard in Southern Gippsland. Without any neighbour to ask how they dealt with the different conditions, it’s been a steep learning curve that's ongoing, yet has created an enthusiasm to apply the knowledge learned to future vineyards that are now in the planning stages. Since planting the vineyard, they have had every type of season thrown at them. Initially they started with droughts and within a couple of years weather conditions delivered two consecutive summers of the highest rainfall in South Gippsland on record. Sub soil drainage has had to be adapted as has the trellis systems all in the pursuit of creating an environment that allows the vines to have the greatest opportunity to produce quality fruit, regardless of the weather conditions that the seasons may and will present. In legendary vigneron Sandro Mosel, they found a winemaker who they’ve managed to interest and engage, who is prepared to work alongside the Rich family in the emerging South Gippsland wine region. They initially made a wine after 3 years which was sold in bulk. It was light, yet it revealed enough to give confidence and to continue shaping the vineyard. Two hundred dozen were made of vintage 2013, the first wine to be released commercially. They thought it fitting to name the wine after its very special location. 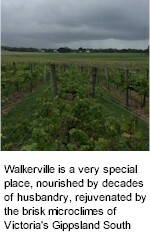 Walkerville Vineyard was born.